I know February is a short month, but this one seems to be whizzing by! My February project for the lovely year of finishes was to bind a quilt I've had sitting around for about 15 years – you can see it here. 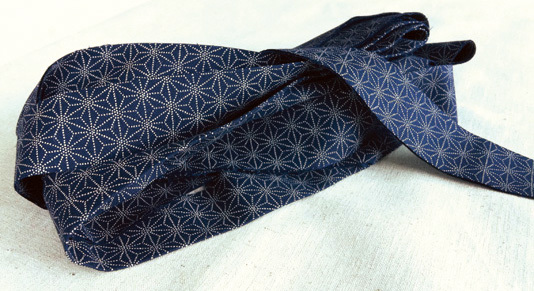 Originally I was going to use the same fabric as the large border for the binding, but I decided I needed something with more of a contrast, so I chose a dark blue Japanese fabric. Now I know this is going to be sacrilegious for some of you out there, but I just don't like cutting binding on the bias, even with the trick of cutting it from the tube of fabric. But, I'm also not a fan of the joins when cutting plain strips. I figured there had to be a better way. So, as I do when I'm looking for anything these days, I googled it. Need to know how to link your Pinterest feed up to your blog? Google it. Need accommodation in Narrabeen for a friend's wedding? Google it. Need to find a better way to do binding? Google it! 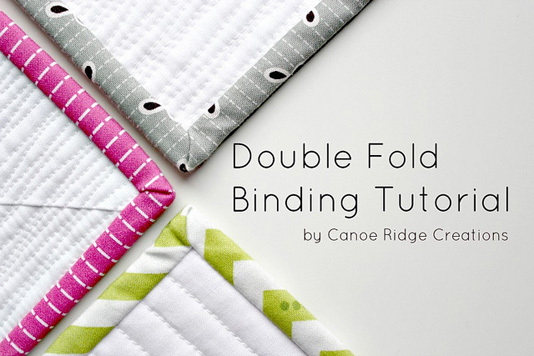 What I found was this fantastic tutorial from Megan at Canoe Ridge Creations. Now I have metres and metres of lovely binding ready to go, and a great way to deal with those annoying corners. The way I was taught was a bit like doing borders – the fabric ended at the corner and it made it quite messy and difficult to fold in the ends. Never again! As you can imagine I'm now following Megan's blog so I can get more of these great tutorials! All my binding ready to go. While I'm keeping up with my February project, the more major one is the quilt for a friend's wedding in a month's time. I thought I'd be able to find the right colour fabric for my borders locally, but when it was coming close to the time I needed it, I couldn't find the right shade. This meant ordering it in from the States instead. I really should have done that months ago, so even though the mail was reasonably fast, a three week wait was starting to get a little stressful. Thankfully it arrived on Friday afternoon at work, so you can guess what I spent the weekend doing? I didn't make it to the fourth side, so there'll be a few evenings spent at the sewing machine this week too. I hope everyone else's projects are taking shape. 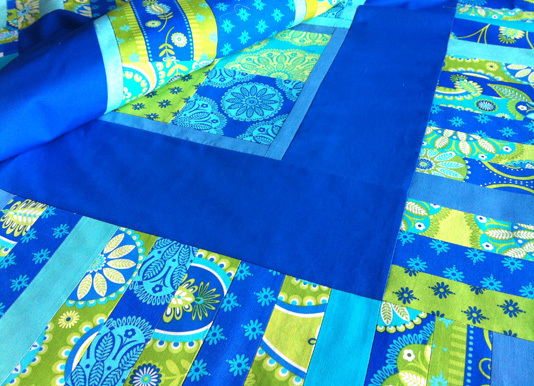 It's been good to be able to link up to the lovely year of finishes group this month since I'm doing a quilt finish. You can see everyone else's February progress here or here.